Kohei Horikoshi was born in Aichi, Japan, in 1986. He received a Tezuka Award Honorable Mention in 2006, and after publishing several short stories in Akamaru Jump, his first serialized work In Weekly Shonen Jump was Oumagadoki Doubutsuen in 2010. 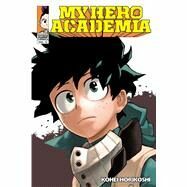 My Hero Academia is his third series in Weekly Shonen Jump.